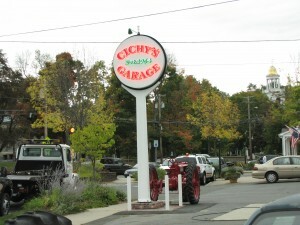 Cichy’s Garage began as part of the Standard Oil Co. of New York (Socony). Socony was purchased by Mobil Oil Corporation and eventually became Socony Mobil. The original blueprints for our building in Williamsburg, MA were drawn on July 3, 1926 and construction began during the later part of that year. From 1926 to 1964 the business had several different owners, and then finally, in 1964 Mitch Cichy Sr. purchased the building from Mobil and Cichy’s Garage was born. In 1989 Mitch Cichy Jr. purchased the business from his father and has continued the legacy of delivering automotive repair work people can trust and rely on. Many improvements have been made to the shop over the course of the last 20 years including: an addition to the building, new car lifts and equipment, brickwork in front of and inside the shop, and a neon sign on the front of the building.